Your shoulder is a ball and socket joint. The shoulder is the most movable and the most fragile joint in the body. But the very flexibility of the shoulder makes it prone to both sudden injury and chronic wear and tear. Our expert Tampa area orthopedic surgeons are highly trained in shoulder surgery and shoulder pain treatments. After age 25, most shoulder pain problems are caused by the effect of repeated overhead motions for a long period of time. Weekend athletes and do-it-yourselfers are especially vulnerable to overuse problems in the shoulder. Under age 40, shoulder pain is usually either a traumatic rotator cuff injury or the result of instability. Instability means the ball slips out of socket. Over age 40, shoulder pain is usually caused by repeated overhead motions for a long period of time, leading to degeneration of the rotator cuff tendon. A degenerated tendon may eventually tear. People over the age of 40 may also develop arthritis of the shoulder, although arthritis of the shoulder is uncommon. The leading causes of shoulder pain are bursitis, tendonitis and irritated rotator cuff. This group of conditions is called shoulder impingement syndrome. What is degeneration of the rotator cuff? Repetitive overuse and / or age can lead to degeneration of the tendons similar to a rope becoming frayed. The tendons become weak and painful. If the degeneration progresses, the tendon can become so weak it ruptures, especially during a sudden activity such as swinging a golf club. Instability means the humerus (ball) slips out of the glenoid (socket). This can occur from an injury and is then called a dislocation (dislocated shoulder). If the dislocation occurs repeatedly, it will lead to arthritis unless the instability is corrected. A less severe form of instability is called subluxation, where the ball slips part way out and then goes back in. Subluxation can be subtle but if untreated will usually lead to chronic strain on the rotator cuff tendon. Dislocation or sublaxation can also cause injury of cartilage in the shoulder. What are your shoulder pain symptoms? Instability, degeneration and arthritis all cause dull achy shoulder pain which can become sharp and severe, particularly with overhead motion. Pain is frequently worse at night. A sudden increase in pain may mean a degenerative tendon has ruptured. A catching sensation may indicate torn cartilage. Rest – Avoid strenuous activity, especially overhead motion or throwing. Ice – An ice pack can help ease pain and swelling from inflammation. Oral Medication – Anti-inflammatory medicines such as aspirin, ibuprofen, Aleve or Naprosyn may help the pain. Cortisone Injections – Cortisone is a very powerful medication and when injected into the area can be very effective in relieving pain and inflammation. Physical Therapy – Once the pain and inflammation are under control, a program of exercise, ice, heat, electrical stimulation, ultrasound and massage is used to help you regain motion. This also helps to maintain the rotator cuff strength. When is shoulder surgery helpful? Thanks to recent advances in arthroscopy, many of the problems that cause shoulder pain can be corrected using the same techniques that revolutionized the treatment of knee problems. Impingement Syndrome is the name given to an irritated rotator cuff, either from repeated overuse or degeneration. Shoulder surgery such as arthroscopy is indicated if the shoulder problem cannot be satisfactorily treated with modification of activities, physical therapy or medication. Rotator cuff repair can be performed either arthroscopically or through a 2-3 inch incision, depending on the size of tear and tissue quality. Arthritis of the shoulder, if severe and disabling, can be successfully treated with a total shoulder replacement. A total shoulder replacement usually requires one day in the hospital. Shoulder surgery can be performed under local or general anesthesia, whichever the patient prefers. What is the length of recovery for a shoulder arthroscopy? Impingement Syndrome – A sling is worn for 3-5 days. Physical therapy is 3-6 weeks. Return to work in 3-6 weeks, except manual labor which may take longer. Instability / Torn Cartilage – A sling is worn for 10 days. Limited activities for 6 weeks. Physical therapy for 3-6 weeks. Return to work depends on the type of work, but non-manual labor is usually 3-5 days. Rotator Cuff Repair – A sling is worn for 3-4 weeks. Return to work in 4-6 weeks. Physical therapy for 6-12 weeks. Full recovery may take 3-6 months. What is the length of recovery for shoulder surgery? A sling is worn for 7 days. Physical therapy for 6 weeks. Return to work in 3-6 weeks. The bursa is a fluid-filled sac that cushions the rotator cuff tendons from the shoulder bone. An irritated bursa is caused by an inflamed rotator cuff. When irritated, the bursa produces extra fluid, the sac expands and the pressure creates pain. This cause of shoulder pain is bursitis. Deep in the shoulder are a group of tendons and muscles called a rotator cuff. They help stabilize the upper arm bone in the shoulder joint and rotate the arm. The biceps tendon is also present in front of the shoulder. When the arm is raised repeatedly over the head, the tendons rub against the underside of the shoulder bone and become irritated. The tendons swell, leaving even less space between tendons and bone. The irritation creates more irritation. It is much like a rope being drawn again and again across a craggy rock. This is called tendonitis, a leading cause of shoulder pain. What is an irritated rotor cuff? Excessive wear on the rotator cuff can lead to severe irritation, roughening and eventually ulceration and tearing of the cuff. An irritated rotator cuff is felt as a clicking or popping in the shoulder from a ragged piece of the cuff sliding under the shoulder bone, and arm weakness. Occasionally, injuries or infections can also lead to arthritis, although arthritis of the shoulder is less common than in the knee or hip. 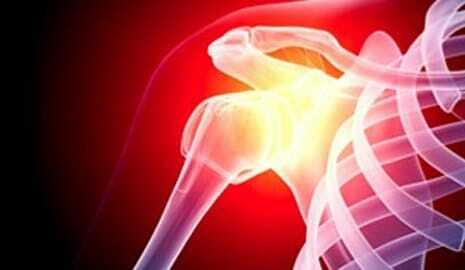 Arthritis in the shoulder causes a roughening of the joint from worn cartilage and loose fragments of bone. Bursitis, tendonitis, irritated rotator cuff and arthritis are all inflammatory reactions to overuse. With any of these problems, a continuous dull ache in the shoulder can become a sharp pain when you try to move your arm, especially over your head. The pain may be worse at night after a heavy day of activities using your shoulder. Once the pain and inflammation are under control, a program of exercise, ice, heat, electrical stimulation, ultrasound and massage is used to help you regain motion. Thanks to recent advances in arthroscopy, many shoulder problems can be corrected using the same techniques that revolutionized the treatment of knee problems. Arthroscopy is an outpatient procedure requiring three tiny incisions closed with one stitch each. This procedure allows the surgeon to see and work inside the shoulder joint. In some cases, however, if the rotator cuff is severely damaged and leads to arthritis, the only option for pain-free motion is a shoulder replacement. Shoulder replacement requires a 4-5 day hospital stay. Where is shoulder arthroscopy performed? Shoulder arthroscopies are performed at the Florida Knee and Orthopedic Pavilion. The time from check-in to discharge usually is as little as two hours. Most people return to their normal activities within four to five days. People with physically demanding jobs can usually return to work in two to three weeks. How can I schedule an evaluation? An appointment can be made by calling 1-727-446-5633, or toll free 1-800-881-8485 if you are outside the Tampa Bay area. Your appointment will be scheduled at the office that is most convenient for you. Office hours are 8 to 5 Monday through Thursday and 8 to 1 on Friday. Shoulder Arthroscopy at The Florida Knee and Orthopedic Centers An avid golfer for many years, Edna Miller of Largo injured her shoulder swinging a golf club. After four weeks of pain and swelling, Edna came to The Florida Knee and Orthopedic Centers for an examination. She and her surgeon decided a closer look was needed. On a Friday morning, Edna checked in for arthroscopy. She was given a general anesthesia, the doctor dimmed the lights and connected the television monitor. Through three tiny incisions (needing only one stitch each to close) in Edna’s shoulder, he smoothed an inflamed tendon and trimmed a small amount of bone in order to enlarge the space between the tendon and bone. Edna took it easy for the next few days and then started physical therapy to strengthen her muscles and restore her shoulder motion. Six weeks later she was back playing golf, moving her shoulder easily and without pain. Make a Shoulder Appointment Today!